Our bully didn't know it at the time, but his Kenner figure -- if he does indeed still own it and if it's still in good working condition, which is doubtful -- is now worth a small fortune. 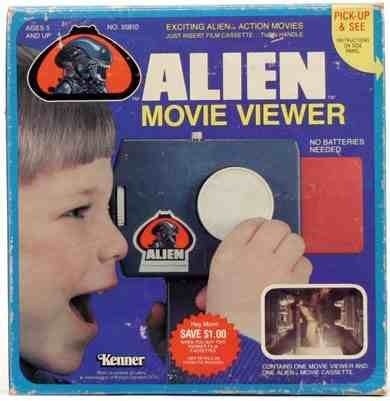 In fact, Kenner released a few toys in 1979 in conjunction with 20th Century Fox to promote the sci-fi horror thriller. The problem was obvious, however: Alien was a R rated film and most kids weren't going to see it (that, and the alien itself has a pretty phallic-shaped head.) The xenomorph figure was yanked from store shelves, making it a now rare collectible...and it wasn't the only one. So let's take a look at four Alien themed toys that could make you a pretty penny, provided you still have one in good condition in the original packaging. Keep in mind I'm only mentioning a few items released in conjunction with the first movie; the sequel, Aliens, spawned (no pun intended) several more toys. 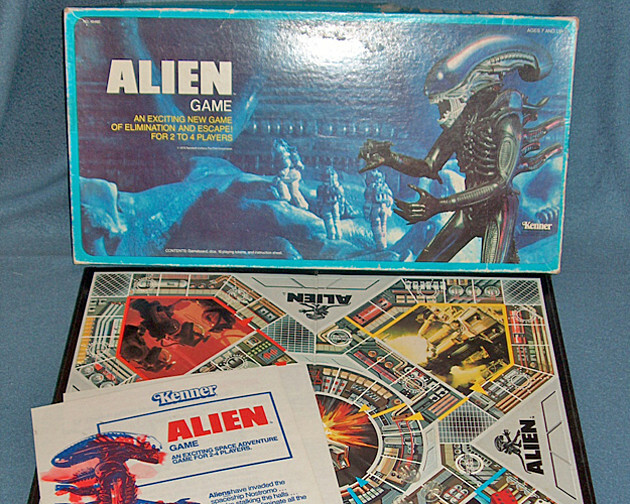 Also rare and released by Kenner was the Alien board game for 2 to 4 players in which the object is to make it safely to the escape shuttle while using the alien to eliminate your opponents. Online reviews say the game basically sucked, but there's currently a used one on eBay listed for over $3,000, which seems insane. Then there was the giant target set by HG Toys that came with a "laser" weapon and three safety balls. The 30" xenomorph would get affixed to a wall, and you'd try to hit the targets in his head and hands that would flip down when hit, but your ultimate goal was to hit the hole that looks like his belly button. That would cause a bell to go off in an "eerie ringing sound" indicating that you killed the xenomorph. Gotta love that they have a little girl playing this game in the toy's packaging. This one goes for about $850 intact. But here's perhaps the creepiest toy of the list. It's a hand-cranked movie viewer that basically condenses scenes from the entire movie into the span of a minute or so (no batteries needed!) I was wondering how much was included when I discovered that someone filmed it with their phone and uploaded it to YouTube. Even though the goriest parts were excluded, I still find it kind of unsettling. There's one listed on eBay for $425. When I saw the first movie, I couldn't help thinking "Gawd, these people are stupid." I was actually kind of rooting for the xenomorph. Does that make me a bad person?? Well yeah, but had they left poor Kane (John Hurt) behind they wouldn't have had a movie! The Prometheus crew is even worse. Although I haven't seen Alien: Covenant yet, I'm hearing the same about some of the characters. 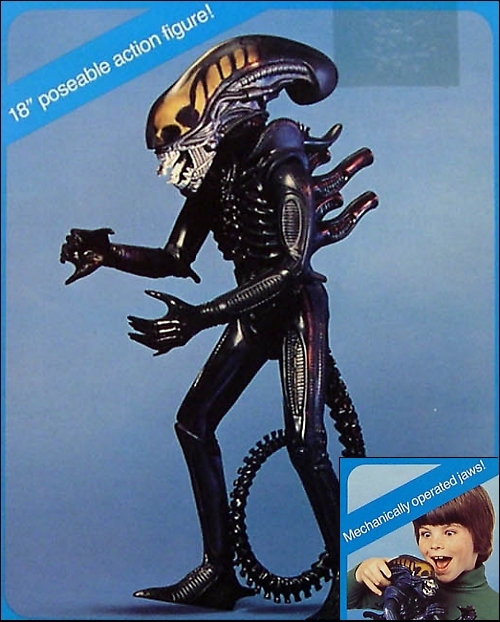 I think what I found even more disturbing than the xenomorph in the first movie was the plot twist that their company didn't give a s*** about them, considered them "expendable", and basically set them up. It seemed to be a foreshadowing of how corporations would operate in the future...aka now.